SweetLime mats are made specifically for kids ages 0-10. Their perfect size ensures freedom of movement and room to grow! A thickness of 3 mm provides enough cushion for growing joints, while keeping the mat lightweight for carrying. 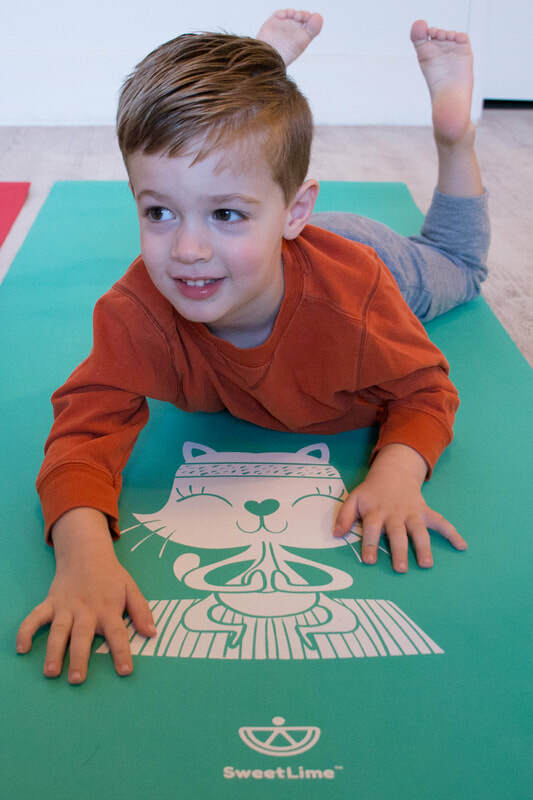 Kids love our adorable characters -- all based on yoga poses to enhance learning about their yoga practice. Our hypoallergenic mats are made from TPE, which is non-toxic, recyclable, and free of phthalates, latex, and BPA. ​​TPE also resists moisture and bacteria and is easy to keep clean. Our special non-skid surface provides optimal stickiness for a confident grip. We are CPSIA compliant so you can rest assured your littles are safe on our mats. Rory the Rabbit loves to hop on his mat in the morning before a nice visit to the garden for a healthy snack. Carlos the Cobra is sssssssuper flexible on his yoga mat and can twist himself into the craziest poses! Cali the Cat thinks yoga is a meowvelous way to focus her energy and practice her balance. We are parents ourselves and know the importance of safe, fun products for kids. Head to our About page for SweetLime's birth story.